Announcing our Free GRE Webinar Series! PowerScore is pleased to announce a new series of online webinars on the essentials of GRE preparation. We have designed a series of four sessions to cover not only the basics of the GRE but also many of the core concepts and strategies that you will need to succeed on the GRE General Test. All four sessions will be held live, online, and free of charge. In addition, everyone who attends will be entitled to discounts off our GRE preparation courses, whether in person or Live Online. Finally, everyone who signs up will receive access to a recorded copy of the webinar attended. Want to find out more? Keep an eye out for our free seminars that we host. After the jump follows a brief description of each. For many students, preparing for the GRE poses a challenge unlike any they have previously encountered; while success on undergraduate finals or even professional certification exams frequently requires hours of study of notes and lectures as well as memorization of facts and information, as an “aptitude” exam, the GRE is inherently different from these tests and must be approached differently. A large factor in students’ success on the GRE is the development of certain test-taking and critical-thinking skills. 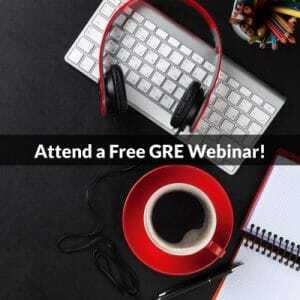 However, the GRE does also test content mastery, and the goal of these webinars is to cover much of the core knowledge needed to have the greatest success on the GRE General Exam. Learn what to expect and jump start your preparation with this comprehensive overview of the GRE. GRE 101 will cover some background on the GRE, the structure and mechanics of the test, and an overview of how the GRE is used in graduate (and business school) admissions. In addition, we will instruct you on test-preparation strategies and approaches. We’ll conclude with a discussion of how to budget your time most effectively so that you can walk into the test center confident that you have done what is necessary to get a great score. 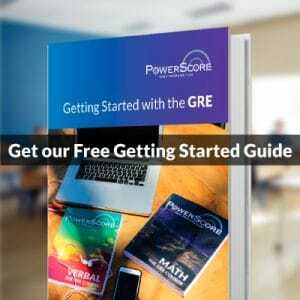 Kickstart your GRE preparation with a primer on the math fundamentals you must master to succeed on GRE Quantitative Reasoning. Sometimes the first time students open up a GRE preparation book or enter their first test prep class, they can find many of the math concepts covered daunting. While almost all math on GRE Quant involves topics familiar to most high school students, the fact is that many have not thought about any of these topics since high school! The GRE Math Essentials seminar aims to give you a leg up on GRE Quant preparation, so that instead of spending all your time relearning old math, you can get right into more sophisticated test-taking and problem-solving strategies. The best time to start building an outstanding vocabulary is right now. Learn the importance of vocabulary on the GRE, how to apply your knowledge effectively, and how to build the working vocabulary necessary to achieve a top score on GRE Verbal Reasoning. Just as Rome wasn’t built in a day, constructing a strong lexicon takes time and effort. In this seminar we will cover how and where vocabulary is useful for GRE Verbal, what kind of vocabulary you need to know, how to strengthen your command of words’ connotations and denotations, and what resources are available to you to help you accomplish this goal. Reading Comprehension on the GRE covers more than just long passages. The majority of Reading Comprehension questions are based on Short Passages, and success on many of these questions requires an understanding of the basic structure and mechanics of argumentation. The GRE of the last ten years has revived a question format that had been absent for over a decade: critical/logical reasoning questions. However, instead of a forthright presentation of these questions as on the GMAT and LSAT, the GRE has a more clandestine approach: testing these skills on Short Passage Reading Comprehension questions. PowerScore is unparalleled in its methodology for teaching this subject, and this seminar will help you grasp logical reasoning fundamentals so that you can not only ace the Short Passage questions but also write a top scoring Analytical Writing Argument Task essay. Whether you are just starting your GRE preparation or are already deep in the process of test preparation, we hope you can join us for one or all of these seminars. Each session is geared towards as wide an audience as possible, and we are eager to meet you and answer your specific questions about the GRE and graduate admissions. During this seminar you will have the chance to interact with an instructor who has finished in the 99th percentile Verbal, 94th percentile Quant, and 99th percentile Analytical Writing on an actual GRE, and get a feel for PowerScore’s Live Online classroom setup. In addition, as mentioned all in attendance will receive a discount on our GRE courses, should you choose to pursue your GRE preparation with PowerScore. For further details and access to all four upcoming schedules, please visit our Free Seminar Page. If you have questions, please comment below or join us on Facebook or Twitter. You can also find out more about our GRE course schedules, free help, and publications by visiting us at GRE Prep & Grad School Admissions.